How It Works: ZP-800 Gear Oil Treatment contains an alloy that far exceeds the basic requirements of normal gear lubricants. Each molecule of molybdenum in ZP-800 Gear Oil Treatment serves to keep metal away from metal. 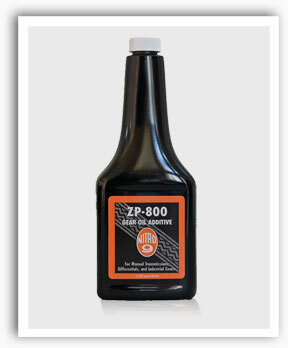 Because of ZP-800 Gear Oil Treatment’s strong affinity for metal, with molybdenum and Vacclaisocryptene, it plates bearing surfaces and acts as a buffer between the wearing and high pressure areas, by filling in and evening out the microscopic hills and valleys present in all bearing surfaces. This important alloy prevents gear teeth from being destroyed through abrasion, peening, pitting, cracking, checking and chipping. ZP-800 Gear Oil Treatment will cushion gear teeth and resist the squeezing action that would destroy most regular gear lubes. What To Expect: High load capacity, high temperature operation and 500,000 PSI protection. ZP-800 Gear Oil Treatment insures against gall and seizure. ZP-800 Gear Oil Treatment will add years of life to any type gear such as bevel, helical, herringbone, rack and pinion, hypnoid, internal, spiral and spur and worm.Significant power transfer, resists galling, abrasion, pitting, peening, and chipping. Applications: Rear differential and power transfer case of autos, trucks, mud pumps, gear ends, rotary tables, chair oil, swivel, pumping units, wireline and final drives on trucks, tractors and all construction equipment. Wire rope life is extended 3 to 4 times by soaking or swabbing rope in a mixture of 1 part ZP-800 Gear Oil Treatment to 20 parts (1:20) light mineral oil or diesel fuel. The same solution can be used for the cooling bath for cutting tools on lathes increasing productivity up to 90%. Directions: Ratio – 1:20. Use at a ratio of one part ZP-800 Gear Oil Treatment to 20 parts of any top quality gear lubricant. For best results, it is recommended that gears be cleaned and inspected before using ZP-800 Gear Oil Treatment. When using on large units, take advantage of the custom tailored programs offered free by our Technical Services Department.